Joann M. Craft, 82, of Carey, died at 12:45 a.m. Tuesday, Feb. 5, 2019, at Bridge Hospice Care Center, Findlay, after a short illness. Born Aug. 13, 1936, in Detroit, Michigan, she was the daughter of William and Marie (Schmidt) Siegel. She married Gary Craft Sept. 1, 1979, at Our Lady of Consolation Church, Carey, and he survives in Carey. Also surviving are two brothers, William Siegel of Monroe, Michigan, and Robert (Gayle) Siegel of Upper Sandusky; a sister, Pat (Herman A.) Lucius of Tiffin; a sister-in-law, Sandy (Dave) Binau of Upper Sandusky; a brother-in-law, Barry Craft of Texas; 15 nieces and nephews; many great- and great-great-nieces and nephews; and three godchildren, Tiffany (Coppler) Mitch, Diane Reedy and William Siegel Jr.
Joann was preceded in death by her parents; grandparents; three nephews, Bobby, Todd and Tom Siegel; and two sisters-in-law, Dolores Siegel and Rosie Craft. 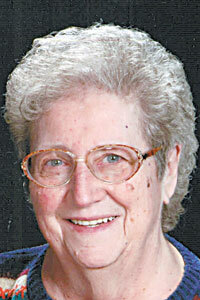 Joann was a 1954 graduate of Upper Sandusky High School. She earned a teaching degree from Ohio University and a bachelor’s degree from Bowling Green State University. She taught at O.L.C. school for many years and was principal at O.L.C. when she retired. She was a member of Our Lady of Consolation Church. She was a devoted Catholic and she prayed the rosary every day. She enjoyed taking bus trips or just trips in their car with Gary. She enjoyed going to casinos and playing bingo for O.L.C. School. Visitation will be 3-8 p.m. Thursday, Feb. 7, 2019, at Stombaugh-Batton Funeral Home, Carey. A Scripture service will be at 7:45 p.m.
A Mass of Christian burial will begin at 11 a.m. Friday, Feb. 8, 2019, at Our Lady of Consolation, Carey, with the Rev. Tom Merrill officiating. Burial will follow in Spring Grove Cemetery, Carey. Memorial contributions may be made to Our Lady of Consolation School or charity of donor’s choice and sent to Stombaugh-Batton Funeral Home, 225 W. Findlay St., Carey, OH 43316-1169.